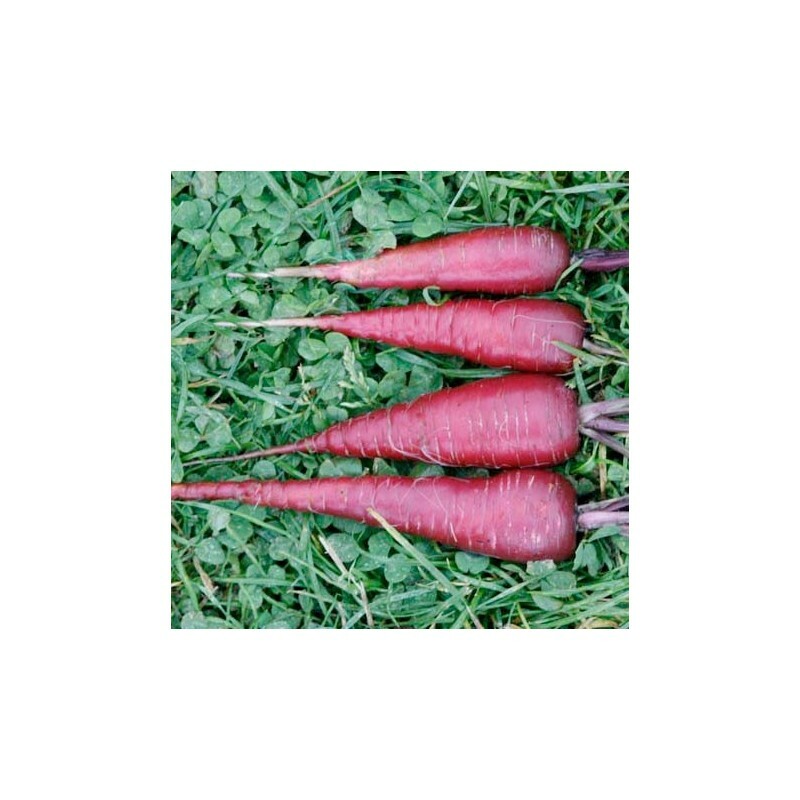 Cosmic Purple has beautiful roots with smooth purple coloured skin and coreless orange flesh. High sugar content makes this variety very popular with children. The coloration of the skin deepens with maturity. Patience is the main thing you’ll need when growing carrots from seeds, as the seeds take long to sprout. Once the tiny seeds are sown in your garden, it could take up to 3 weeks before you see any evidence of their germination. The fresh crunch of homegrown carrots are well worth the wait and you can use these guidelines for planting and growing carrots from seeds. 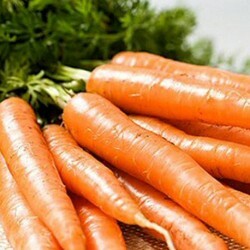 Select a sunny location that has well-draining soil to use for your carrot bed. Make sure they will not be shaded by other garden plants or surrounding landscape plants or trees. While the carrot develops underground, the green tops grow above the soil level and need full sun to provide nutrient to the developing root. 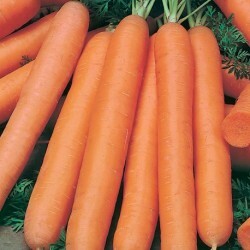 Carrots will grow deep and to make that growth easy for them the soil will need to be tilled deeply. Till soil to 12-18 inches deep then add 4 inches of compost and lightly till it into the soil. Remove all rocks and debris and rake the soil smooth and level. Make shallow trenches, 2 inches deep and 6 inches apart, in the prepared garden soil. Place a marker at each end of the row because it could be 3 weeks before you see any sign of growth and you will forget where the planted rows are without markers. Carrot seeds are very tiny and not so easy to place exactly where you want them, but that’s an easy fix after the seeds germinate. For now, try to place 2 seeds in the trenches every 2 inches. Err on the side of planting too many seeds, rather than not enough, then the plants can be thinned to the desired spacing later on. Lightly cover seeds with 1/4 inch of soil, water in well and firm soil with hand. During the long wait to see signs of life in the carrot bed you will need to keep the soil moist at all times. A spray bottle filled with warm water is the best way to keep soil moist without disturbing the tiny seeds. The warm water will help promote the germination process. Now is the time to be patient, signs of life should emerge from the soil in 7 days, but all the underground activity depends of soil temperature, weather conditions and carrot variety. It could take up to 21 days before you see green carrot tops peeking through the black soil. 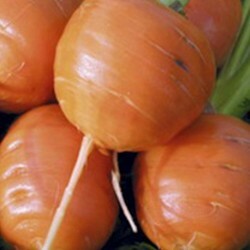 After germination, carrots will begin to develop quickly. When the shoulders are visible above soil level, apply a 2 inch layer of organic mulch to cover the carrot shoulders and prevent them from turning green due to sun exposure. The layer of mulch will also prevent weed growth and help retain soil moisture. The compost worked into the soil will provide enough slow-release nutrients for the carrots during the development and no other food will be needed. Water carrots deeply once a week during times of drought. 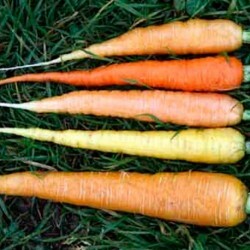 Carrots can be harvested at any stage of development, but are best when they reach the brightest stage of their intended color (bright orange, bright purple, bright white, etc.). To harvest without damaging the vegetable, scratch away the mulch and some of the top soil at carrot shoulders. Moisten the soil, then firmly grasp the top greenery right where it meets the top of the carrot shoulders and pull upwards. Use a rocking motion if you have trouble removing the vegetable from the soil. Remember the green carrot tops are edible and full of nutrition too, so try them in your salads and salsa. Fresh homegrown carrots will keep for months if stored properly. After removing them from the garden soil, wipe them off with a dry paper towel and store them in vegetable crisper of the refrigerator until ready to eat. To store a large crop of carrots, place them in a box of sand or sawdust and keep them in a location that stays below freezing. You can also dig a trench in the garden, lay freshly harvested carrots in the trench and cover them with garden soil or sand until you’re ready to eat them.